I have never made anything with Halloween theme before;cookies,carving pumpkin etc. This is my first bento and I got inspired by Sheri's blog at http://happylittlebento.blogspot.com/ to carve something. I used red grapes and it is difficult to carve. I was thinking 'Sheri must have real steady hands'. Mine tend to shake with the knife after my 2nd grape!! It didn't look good and I thought of giving up but well,at least I tried. Here is the embarrassing pix.Packed the lunch,100% grape juice and ice pack in his insulated 'friendly monster' lunch bag. Cute lunch! 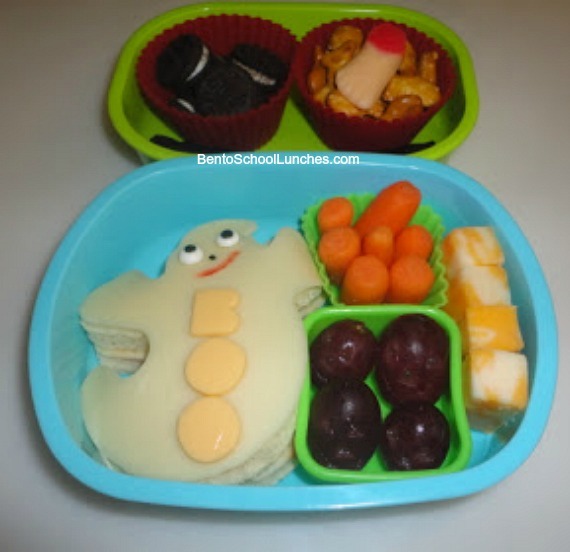 ADORABLE lunch box!! Thank you for your kind comment Diana.